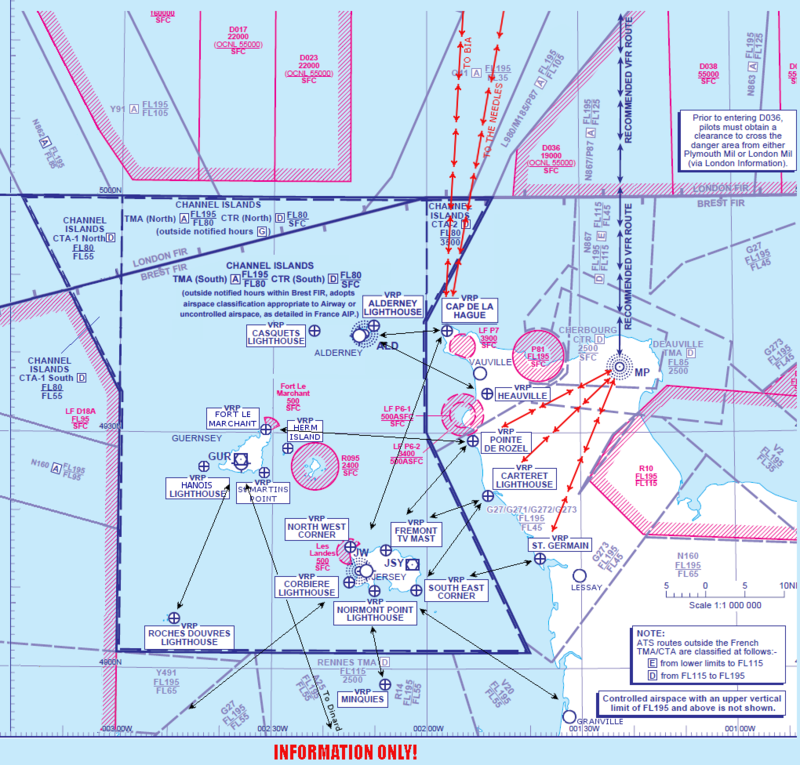 In order to reduce the risk of delay, re-routing or extensive holding; flights operating on a VFR or Special VFR clearance within the Channel Island Control CTR can expect to be issued a clearance based on recommended routes between notified Visual Reference Points. These routes have been established in order to keep VFR traffic clear of any restricted areas, de-conflicted from IFR Departures and Arrival tracks and Inter-Island routes. Clearance is normally available to route between Alderney and the North or Western Zone boundary (50N/3W) subject to the status of any Danger Area Activity. Clearance is normally available to route between Guernsey and the North or Western Zone boundary (50N/3W) subject to the status of any Danger Area Activity. Clearance is normally available between Jersey, Guernsey (GUR) and 50N/3W in the direction of Berry Head (BHD) although during periods of high traffic workload Pilots may experience extensive track deviations in order to route around or over airspace delegated to Guernsey Approach Control. Please Note: No standard route exists between Jersey and Cap de la Hague, Pilots should expect zone entry clearance via the standard routes at Pointe de ROZEL, CARTerate Lighthouse or St GERMain, however, a more direct clearance via Cap de la Hague may be offered by the Controller subject to sector workload and traffic complexity. Pilots remain responsible for obtaining information regarding the status of any Danger Area Activity and/or for requesting a Danger Area Crossing Service from the appropriate Air Traffic Service Provider. Pre-flight information regarding the status of the Danger Areas north of the CICZ may be obtained from Plymouth Operations Tel:+44 (0)1752 557550. Danger Area Crossing Service DACS: Plymouth Military on 124.150 MHz when open. The restricted areas at Cap de la Hague and Cap Flamenville are strictly policed by the French Military and Pilots should exercise due diligence when routing in the vicinity of these areas. * These Flight Plan route abbreviations should only be used when filing a VFR flight plan for entering or departing the CI CTR. They may not be recognised by any other Air Traffic Control unit or Service Provider in which case normal ICAO Flight Plan route identifiers must be used.